Back in September of last year, I had a chance to fly fish with poppers for tarpon in the harbor of San Juan, Puerto Rico with a fishing guide that my wife found for me on the Internet. I had booked an early morning session from 6 AM to 10 AM because the winds are normally calmer early in the morning. I used some of the saltwater poppers I had made. Had a great time jumping 15 tarpon and landing 7 of them. They weighed 10 to 35 lbs. I was really eager to get back to try my luck for some more of these great jumping fish. 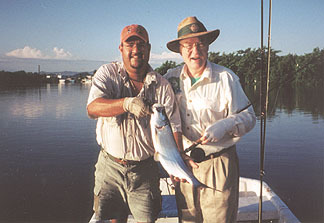 The chance to go back to Puerto Rico came this May 5th, a week before our PFF club fishout in the Bahamas for bonefish. 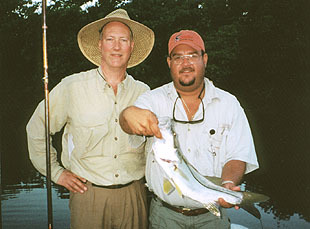 David Harris and I had signed up for the bonefish trip. We decided to leave early and fish in Puerto Rico for a week, planning to fly back to Fort Lauderdale, FL on the 12th of May. We booked our guide, Rafael Apellaniz over the Internet. His email address is:rafa@puertoricotarpon.com (Rafael Apellaniz). We wanted to fish for at least 4 days out of the seven we would be there. We planned to fish for tarpon, snook and peacock bass. Rafa had spoken about fishing for peacock bass at some inland lake earlier, so we wanted to try our luck for them while in PR. We booked a small hotel in the outlying area of San Juan called the Arcade Guest House. Hotels in San Juan can be pretty expensive, but this one was fairly reasonable at $73.60 per night. We just wanted a place to crash after a long day of fishing. We were told we would be picked up at 5 AM each morning. Sure enough our ride was waiting for us right at 5 AM. We were picked up by Cesar Colon, a friend and fellow fishing buddy of Rafa. Cesar would be our fishing taxi driver for the week. Cesar loves to fly fish so he was great to visit with. 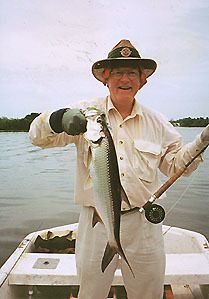 His largest tarpon on a fly was 80 lbs which is as big as he is. He says he would rather catch the 25 LB fish because: "They are more fun and more frequent." He would deliver us to the boat ramp, once we stopped for some coffee and donuts at a local gas station. That was our breakfast as very few places to eat were open at 5 AM in the morning. Rafa normally supplies all the gear for people that want to fish. 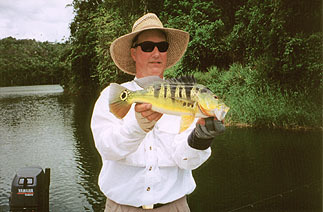 He is one of the few guides in Puerto Rico that cater to those that wish to fly fish. He has 8 weight and 10 weight fly rods with reels all set for tarpon. We brought our own gear. I brought a 7 wt and a 9 wt rod that I planned to use for bonefish, as well as a 12 weight outfit to tackle the 100 lb+ tarpon that we might get into. Most of the tarpon are in the 10 to 50 lb. range but at this time of year we could expect to get into some big ones. 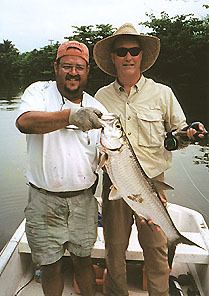 The largest tarpon caught in Puerto Rico was a 187 LB fish that a fisherman landed with a hand-line some years back. We would happily settle for that ones smaller cousin. The weather during our week wasn't the best because the winds were up early, as well as having rain storms almost every afternoon. Our fishing day was usually from 6 AM straight through to about 2:30 PM each day. Rafa supplied lunch and drinks (sodas and water) while we were fishing. We wanted to fish the harbor with poppers but the weather didn't cooperate, so we had to settle for fishing in the 80 foot wide canals by a mile long that the rivers flow into before emptying into the harbor. We would try the canals first and if the fishing was slow there Rafa would pull his boat out and take us to a local lake that was fed by a river but was affected by the tides as it was so close to the ocean. This local lake wasn't affected much by the wind, so we could always find fish there. If you can get your fly close to these tarpon with the right motion they will hit it. That is the great thing about fishing for tarpon in Puerto Rico. They can be found there all year round close to San Juan. We had some slow days and some good days but we caught fish every day. Turns out one of the best flies to use, especially on the lake was a large bonefish fly that was heavily weighted. It was all white with some pearl colored flash-a-bou in the tail and body. I used a floating line most of the time with a 7 to 9 foot leader with a 12 lb. tippet. Some times I used a sink tip line. Most of the time the fish were close to the surface so a quick cast ahead of them with a strong quick 6" to 8" strip with a distinct short pause between strips got a strike. 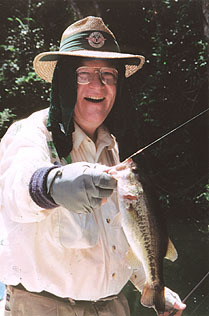 You set the hook by pulling on the fly line hard before lifting your rod. A rod set normally will not drive the hook into a tarpon. Most of the fish we caught were in the 10 to 25 LB range. David did jump a 100 lb+ fish one morning in the canal. After a short fight the fish was able to throw the hook. One of the lessons a person who fishes for tarpon learns is that you really have to set the hook hard with these tough mouthed fish if you want a chance to land them. On Wednesday morning we took off for an inland lake about one hour from San Juan to fish for peacock bass. It was a great looking reservoir with a lot of cover for Peacock bass. We were using floating lines with small streamer flies as well as our trusty bonefish flies to catch these beautiful fish. During the day we caught peacock bass and some small gray colored fish, which is like a perch. We also caught three catfish and a large mouth black bass on our flies. Like the bass fishing we do at home, the best strikes came when we cast back into the shore as close to the brush as possible. We didn't have the 100 fish day we had hoped for but still had a great day of fishing. It turned out to be a very long day. We left our room at 4:45 AM that morning and got home at 8 PM after a Chinese dinner. We were sure beat so sleep that night came easy. We had 5 days of good fishing landing about 30 tarpon, a half dozen snook, and a mess of peacock bass. All fish were let go to fight another day. On the one day that Rafa had another client booked, the weather turned out great. That client used one of the big salt water poppers I had given to Rafa to catch a 40 lb. tarpon in the harbor. On Friday evening Rafa and Cesar took us to dinner at the local yacht club. He fishes with a group of fellows that have a deep sea fishing boat to go after sail fish and marlin. What a great dinner as a sendoff. We sure plan to come back and fish with our friends in Puerto Rico. You can access Rafael on his website at: www.puertoricotarpon.com . We left Puerto Rico on Saturday morning to meet the other 8 PFF club members in Fort Lauderdale for our flight to South Andros Island in the Bahamas for bonefish. I know it's a hard life, this fishing, but someone's got to do it.